just thought i would place one here first, if that OK? Couple more kits added to the stash today. Nipped into my local ALDI after getting a bus that seemed to go all across the Toon, only to find that the only Airfix starter sets that they had were the Mustang. Due to limited funds, I only nabbed the one. Just had the Modelik 1/25 MRAP Cougar delivered. It's a card kit with Russian instructions. Should be an interesting build. Still considering whif ideas for them. From BNA Model World two sets of one of the best detail upgrades for 1/25 cars - I love these sets. These will be used when I scratchbuild the chassis for this years Scale Cannonball Run entry. 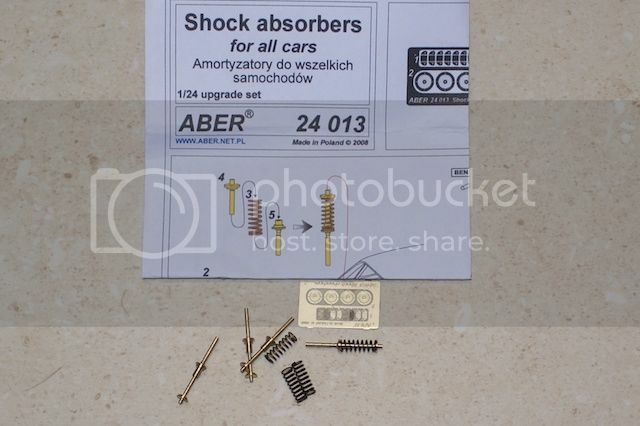 Strange how different countries use 'Shock absorber' and 'spring' interchangeably though, even though calling a 'shocker' by that name is totally wrong. It's really a 'damper' and the 'shockers' in your packet of bits really ARE 'shockers'. Nabbed a single copy of the new 1/72 Airfix SeaKing Commando HC4 a few days ago. an option for folding main rotor blades is quite good but a folding tail is perhaps a first for any 1/72 seaking. Got the CyberHobby 1/72nd HS Sea Vixen FAW2 off Hannants yesterday, also got the replacement Pavla resin ejector seats to replace the under scale items and the replacement nose cone with the more defined point. Best part was the kit had an RRP of £14.99 where as the FAW1 kit had the £34.99 price when released !! !, so the FAW2 is now in a proper price bracket and apart from the seats and nose it builds into a rather tasty Sea Vixen unlike the other kits on the market in this scale. They are the sort of detail parts I have to force myself to use as they are almost too nice to risk spoiling them by attaching them to a model which doesn't do them justice. Studio 27 PE disc brake sets (with resin calipers) fall into the same category. Tell me about it! I have a white metal Ardun head flat-head Ford engine kit that's so superbly cast that it'd be a shame to build it and install it in a model where it would be hidden under a bonnet/hood.